Brighten someone's day with "take-out"! Enlarge the take-out box template to fit a 12x12 size paper. 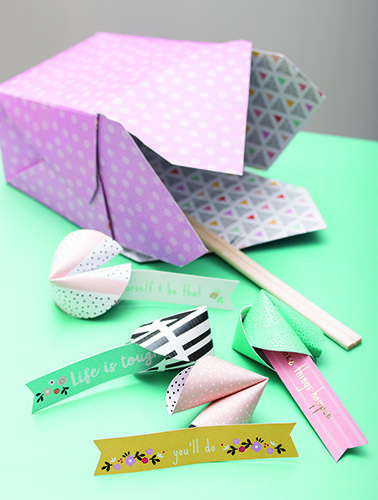 Cut a page from the Sweet and Sassy Paper Stack to match the template following the solid lines for cut lines. Score the paper according to the dotted lines on the template. Fold the sides up and fold the tabs between sides outside the box. Adhere tabs between the box sides to the side of the box. Switch up the paper with a different DCWV paper stack!